Does it feel like immigration has been the only thing being talked about on the news these days? While it hasn’t been the only topic of discussion, it can certainly feel that way because Immigration has been a major point of political discussion in recent months. Between the government shutdown over funding to build a border wall, the travel ban, and so many other changes, it’s easy to see why immigration stories are almost constantly being covered. It also makes it difficult to keep track of what has changed. While this isn’t necessarily a change in immigration policy in the strictest sense, it did get a lot of changes rolling for the current administration. The travel ban was instituted shortly after the current administration took office, and it limited arrivals from North Korea, Venezuela, Yemen, Somalia, Libya, Iran, and Syria. When the travel ban went into effect, it was almost immediately contested, but recently the ban was upheld by the Supreme Court. In the two years since the travel ban was initiated, the US has seen an 81 percent drop in visitors from the affected countries. With very few waivers being issued, the dramatic decline in visitors from those countries has helped to pave the way for other widespread changes. Overall, legal immigration from Muslim-majority countries has fallen by about a third in the last two years. Deferred Action for Childhood Arrivals (DACA) was a program initiated as a way to give better options to undocumented immigrants who were brought to the US as children. DACA is not a way for immigrant children to gain permanent residency; it was started as a way to allow immigrant children, called Dreamers, a chance to gain work permits and go to school legally. More importantly, it gave these children a chance to avoid deportation while they took the time to apply for legal immigration. The current administration has made moves to begin phasing out this program. With this change, the US Department of Homeland Security was told to stop accepting new applications and renewal applications with the intention of phasing out participation as those permits expire. This move was contested by multiple states, and the results are still working their way through multiple courts, so the results aren’t final yet. As of now, no new applications are being accepted for DACA; however, those with existing cases can still apply for renewal. Applications are also not being accepted for advance parole, meaning DACA recipients cannot leave the country and expect to return and still be eligible for DACA benefits. However, even with DACA in flux, other avenues for legal immigration are still open to DACA recipients and applicants. The other major, widespread change that has happened over the last two years is a change in approved visas. Nine out of the ten countries that typically have the highest rate of immigration to the US have seen a decline in application approvals. Visas granted to immigrants from China, India, the Philippines, Vietnam, Bangladesh, Haiti, Jamaica, the Dominican Republic, Mexico, Pakistan, and Afghanistan have all gone down. Approvals to immigrants from African nations have also seen a 15 percent decline in the last two years. Conversely, immigration approvals to European nationals have increased, but the number of applicants is much lower than those from Africa, Asia, and Latin America. A part of the decline in application approvals can be attributed to the decline in applications. The main reason for this is likely the anti-immigrant rhetoric that has been pushed in recent years. However, a smaller but still important factor is that there is a huge backlog of immigration cases waiting for their hearings. As of November 2018, that backlog had reached more than 800,000 cases — and that was before the government shutdown impacted things. The huge backlog of immigration cases means that court hearings (and their decisions) are being scheduled out 2–3 years from when the application is submitted. This has been a prevailing issue for much of 2018. Immigrants crossing — legally! — at the border between the US and Mexico have been detained in increasing numbers. In the last two years, the US has seen record-high numbers of detainees waiting for deportation hearings. For those who may have missed the news, a large number of those detainees have been separated from their children at the border — children who are also being detained in poor conditions while their parents await hearings. As we mentioned earlier, the US currently has a huge backlog of immigration cases awaiting hearings. This number swelled in early 2019 when the government shut down for 35 days. During the government shutdown, non-essential personnel were furloughed and several departments were closed or operating at low capacity. During the shutdown, a vast majority of scheduled immigration hearings were canceled. Because of the already large backlog, there’s no good way to simply push back court dates by a couple of weeks, so the individuals who had their hearings canceled are now looking at another multi-year wait for the new court date to come around. As you can see, there have been a lot of changes to US immigration over the last couple years. For anyone interested in trying to immigrate to the US, navigating the changes can be particularly daunting. Fortunately, there’s no need to go it alone. The best option to understand the immigration process and to choose the best immigration option for your situation is to work with an immigration lawyer. We stay on top of the changes so we can provide the best guidance for everyone we provide immigration help, no matter what kind of visa or other immigration application you are eligible for. Navigating US immigration is complicated, and working with an immigration lawyer will help you find the best path to immigration for your circumstances. 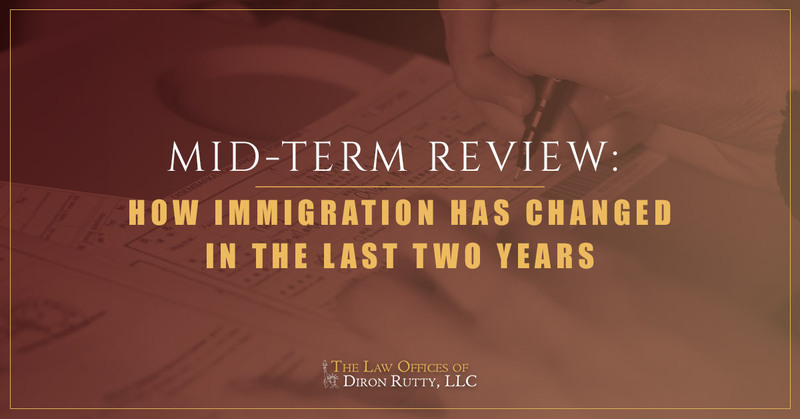 If you’re looking for an immigration lawyer in the Bronx or across New York City, connect with the Law Offices of Diron Rutty, LLC today!